Lanka Ashok Leyland expects to launch ‘Palace on wheels’, a luxury bus concept which will help travellers hit the road in style, officials said. “This is a luxury motor home where passengers get amenities of their residence,” Umesh Gautam, CEO, Lanka Ashok Leyland told the Business Times, noting that they want to launch it soon. He said that the Rs 14.5 million bus has two bed rooms, a living room, a shower area, a conference room and a toilet. He added that the company is taking its luxury design expertise and applying it to this sector in response to customer requests. “We have two buses at present which we brought down from India. 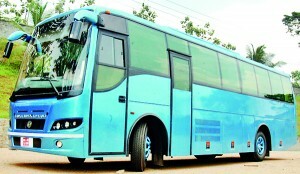 We will assemble the other buses in Sri Lanka according to customer requirements,” Mr. Gautam said. The bus has air suspension so that it won’t jerk and it also has automated transmission. “We understand the needs of customers seeking a luxury road experience, especially for long distance trips like from Colombo to Jaffna. 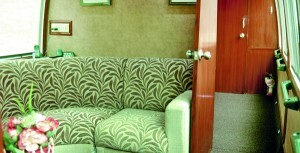 This will be ideal for something like a small group of travelers looking for a more comfortable journey,” Mr. Gautam said. The company performance for the quarter ending 31st December 2012 was the poorest for the organization with revenue falling by over 50 per cent to Rs 1.7 billon against Rs 3.6 billon for the same period in 2011, he added. He said that interest expenses were Rs 117.6 million for the quarter, constituting almost 62 per cent of the entire Rs 9 million finance cost. “We have heavy pressure on margins due to the large inventory and we are paying large interest,” he added. He said that the Ministry of Transport has ordered 200 buses which would be delivered by the month-end. “This (revenue) will help our inventory to come down. By March we expect this to come down,” he said, noting that the conditions for vehicle sales will pick up. This is not the inside of a luxury railway compartment or a Colombo apartment but a new bus to hit the road soon. Lanka Ashok Leyland will be shortly launching its 'Palace on wheels'. Pix by Nilan Maligaspe. The company posted a net profit for the first nine months of this year (ending 31st December 2012) of Rs 643 million, down 50 per cent over the corresponding period in 2011 which was Rs. 1.2 billion. “The main proponents to the sluggish performance are the severe cost pressures stemming from large foreign exchange losses and finance costs. The currency depreciation earlier last year and the high interest rates adversely affected the bottom line going into the third quarter of the fiscal year,” Mr Gautam said.